If you haven't heard of them yet, Bellissima Scarves is a company which launched around a year ago, and has become one of the best hijab brands around. Unlike many retailers, Bellissima provide unique and exclusive designs which are produced in Italy. You can read an interview with the founder here. Today's review is for the Roma Antique Gold, which is part of the Winter 2010-11 collection. This isn't the first time I've tried Bellissima Scarves, though my impression this time round was just as good! The scarf arrived within 2 days and was simply packaged. The first thing I noticed was that the colour was slightly darker than the photo on the website. However, the fabric itself is lightweight and the mixed pattern is quite prominent. 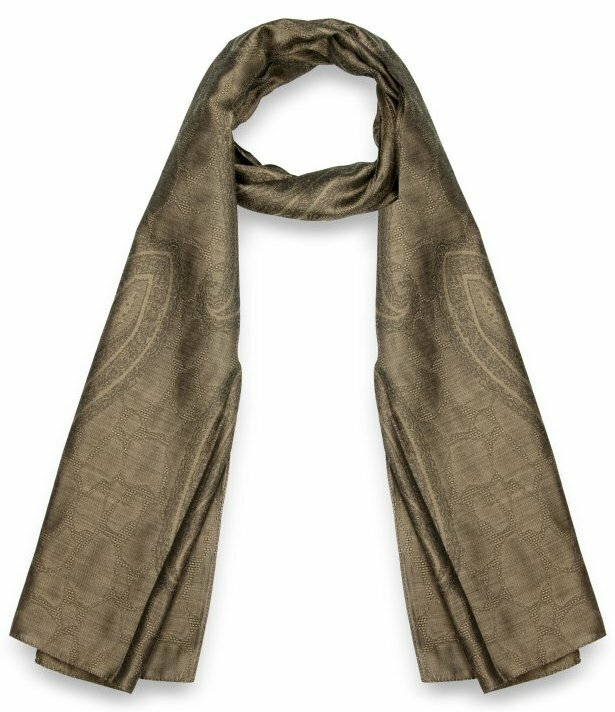 The subtle golden sheen makes the scarf feel quite luxurious and classy. The scarf is totally opaque even at one layer, which means you have a lot of flexibility with the styles you can wear it in. At 52cm x 170cm, it's has plenty of length, though I do feel it could be a little wider to give easier coverage at the back of the neck. The fabric also tends to be stiff and a bit difficult to work with when first bought, however over time I've found that it does get softer and easier to drape. This scarf goes particularly well with neutrals such as browns, blacks, beiges and greys, and is a classic that you can wear year after year. The Roma scarves also come in a several other colours, my favourites being the magenta and teal blue. I've been a fan of Bellissima Scarves since they launched, and the Roma Antique Gold is no exception to the classy, well made and beautifully finished scarves they produce. Customer service is excellent and as an added plus, standard UK delivery only comes in at roughly 90p per scarf. You can get 15% off your order when you enter the code HSWINTER2010 at the checkout. This offer is valid only on the New Winter Collection and ends 6th January 2011.